This morning is the best of both worlds. 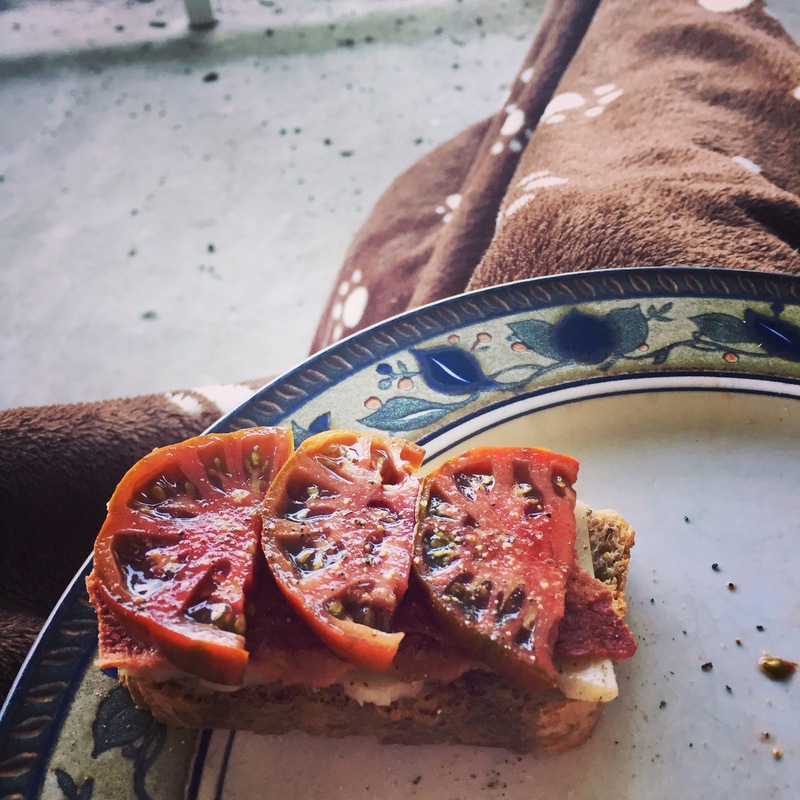 I came out on the front porch with my breakfast – homemade bread topped with cheese, bacon and some of my final luscious Black Krim tomatoes – only to have to go back inside for a blanket. I can see my breath! I love the crispness of fall. I can really feel that I’m at the edge of two seasons: still enjoying the taste of summer while bundling up against the cool fall air. This is one of the reasons I enjoy Ohio: the shifting of the seasons always makes me feel renewed. There’s something to enjoy in each seasons. In winter there’s rest and rejuvenation, time for sitting and reading and projects I’ve put off. There’s snow and fires in the fireplace and that feeling of being tucked in under a big white blanket. There’s holidays and traditions and time with family. By spring I am planning, dreaming, itching to get my hands back in the dirt. There’s a garden to be laid out and soil to be prepped, seeds to be started and the excitement of old favorites and trying something new. Wildflowers begin to blossom and I start picking like mad; jellies begin to fill the pantry. Our first garden fresh meals appear on the table with early greens, overwintered carrots, just collected eggs. Summer is busyness. Never enough hours in the day. Dirty hands and sweaty bodies. My nails are never completely clean. It’s planting and weeding and pruning and picking, on repeat. It’s hours spent in the pool and pizza parties in our swimsuits. Summer is late night dog walks because that’s the only time when my little friend won’t overheat. It’s watching the moonrise as we walk and feeling the heavy night air, alive around us. Fall is crisp mornings on the porch with my coffee, under a blanket, with the dog tucked in next to me. It’s sweaters and jackets and boots being pulled out of hiding. Fall is finishing up the garden and tidying up the house. There’s baskets of things on the porch waiting for the canning pot or freezer: a final picking of peppers and tomatoes, baskets of pears from our tree, apples from Michigan, potatoes and sweet potatoes, even a few figs. Fall is the beginning of turning in, settling down, breathing again. I don’t think I could live somewhere without seasons. Each one has its own beauty and I’d miss it if it were gone.